Zac Efron is the only man I'd consider going straight for — before realizing that I still don't wanna do that... BUT EITHER WAY, he hot! He hot as heck! And I truly believe, after all the years that I've been closely following the evolution of Zac Efron, I must say...2018 was his hottest year!!!! First of all, in 2018 he grew a beard. 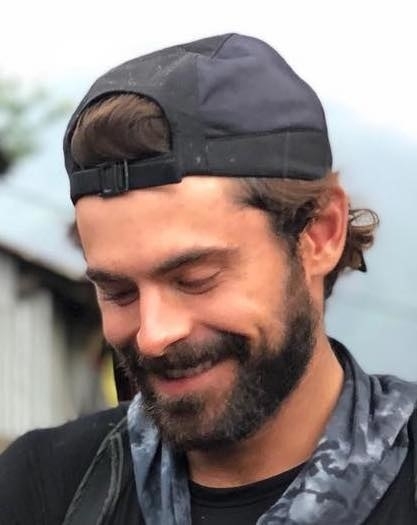 Scientific studies have proved that beards are hot, therefore Zac with a beard is hot. And you know what's even hotter? Zac Efron with a beard while hugging a dog. Also, in 2018, Zac took this pic. It's one of his hotter pics! A sunset? Check! A Parisian landscape? Check! A sultry gaze? CHECK!!!! To further prove my point I give you this evidence to the peoples. This is a photo that did not exist before 2018, but features bulging muscles both in the arm and leg region. He also went skateboarding shirtless. I know that this is something he has done in the past, however in 2018 it's just hotter. I can't explain why, it just is! And finally, in what ultimately was the deciding factor in my decision to declare this Zac Efron's hottest year, he rode a horse lookin' like the cowboy of your dreams! He did all of that!!!!!!!! In conclusion, 2018 was Zac's hottest year yet!! Bless him for existing!! !